Circling Yamal 1- delinquent treering records? Update 13th Oct: new page with details from Briffa's work here, including the 12 trees and map of proxy sites. This article was posted at Jeff Id's Air Vent; at the same time, Steve MacIntyre found the Briffa data, and laid it bare. Newcomers can learn the full story with Bishop Hill. Look for UHI effects here. This is more work in progress, following Circling the Arctic, in particular I was inspired by Bill Illis (05:42:38 on WUWT, 9/9/09) who provided links to the Yamal material and Kaufman's data. I am still learning a lot, and am open to being corrected / improved (email preferred). My motivation for doing this was my certainty that Briffa's Yamal data should never have been used in Kaufman 2009, and that visual comparison to thermometer data can help people see this easily. John Daly collected NASA GISS records that were reliable, longstanding, not-moved rural stations: the Vardo group, the Kanin Nos group, and the Salehard group. Today the NASA records all start at 1880, thereby losing a vital cornerstone of information I find trustworthy. For the early Arctic records were kept by those who had a big reason to get them correct: the life of their community. I've been accused of cherry-picking, but I maintain that Daly's criteria are actually good science. Understanding is helped by individual stations, names, places, and pictures, not just nameless averages. And "auditing" climate science is about reconnecting professional standards and the best specialists with basic principles and good amateurs and commonsense, where user-friendliness is essential. But to forestall objections, I've included records here from four Russian cities that were specified in response to "Circling the Arctic" at WUWT. This lengthens the discussion but does not undo the conclusion, in fact it makes it more - what - "robust". There are a number of important details to glean from these records. On first sight, it looks as if the treering proxy record (the "rearing snake" shaded faint against each thermometer record) is way out of kilter, excessive by comparison with all thermometer records, and patterned differently, but it's good to look at details with an open mind. The treering record shows temperatures relative to a mean, not an absolute level. All my thermometer records with treering record faint overlays are identical scale, with 10-year divisions from 1841 to 2011, and 2ºC divisions from -18ºC to +4ºC. There is one interesting piece of evidence from this Hockey Stick, that the Air Vent shows even in assemblages of less-distorted proxy records. The pattern of temperature change still make a sort of Hockey Stick: slower fall, faster rise. Now observe: this pattern appears again and again in the ice ages temperature sequence. Temperatures in general appear to rise rapidly, compared with rates of temperature decline: a natural pattern. What the Yamal treering evidence shows, however, appears to be a very exaggerated distortion. Moreover, the statistics method used by Mann et al appears to be capable of producing a hockey stick out of any data - see Jeff's June series of posts starting with Hockey Stick Revisited part 1. Now to the thermometer records. Savour the environment of Yamal, just north of the Arctic Circle. It is flattish, watery, permafrosted tundra with trees in a few places, fairly maritime, bordering a sheltered area of the Arctic Ocean to the north and the Siberian landmass to the south. Bjørnøya, Vardø and Murmansk are surprisingly warm - Murmansk has a similar latitude to Ostrov Dikson and Hatanga. Perhaps proximity to Gulf Stream waters, and distance from continental centre of mass, raise their mean temperatures. Siberia has an extreme annual temperature range due to landmass; and the greatest departure from "norm" is the winter cold, not the summer warmth. Vardø: the record shows virtually no trend at all, certainly no marked change into uplift from 1900 or so. But its detailed patterns correspond very well with those of nearby Murmansk, and reasonably well with Bjørnøya. Vardø lacks the decadal fluctuations shown by Bjørnøya, but Murmansk, that resembles Vardø very closely otherwise, shows decadal fluctuations. Kanin Nos, Ostrov Dikson and Ostrov Vize temperature patterns all have high correlation with those of Bjørnøya and Murmansk, both short-term and over decadal fluctuations. Salehard, Turuhansk and Hatanga likewise show short-term and decadal fluctuations similar to Bjørnøya and Murmansk. From such similar patterns - with fluctuations but without sudden large upswing around 1900 - one can IMO reasonably infer from Vardø the sort of pattern all these other stations would show. The uniquely steady temperature at Vardø puzzles me. Does it indicate comparative freedom from Arctic sea ice? The Irkutsk group: these are similar to each other, both in short-term fluctuations and in overall pattern; they resemble all the other records less, both in details and in overall pattern. Do they indicate continental, rather than Arctic maritime patterns? Is this difference also a hint about (delayed) effects of PDO and AMO on Arctic maritime temperatures? The Irkutsk group were chosen, with records since 2002, to answer allegations of cherrypicking. They are furthest away and their environment is very different - mid-continental. All these cities lie on major railway lines. Recent years since 2002 are actually irrelevant since the big proxy upsurges started around 1920, 1950, and 1980. But even with their steady rises since 1950 or so, Irkutsk, Omsk, Barnaul and Krasnoyarsk all show considerably less warming than the Yamal treerings, and a different pattern. Note the typical interannual variation of temperatures: the colder the mean, the bigger the fluctuations in general - and the harder to eliminate "noise" signals. Or perhaps those fluctuations are evidence to a different beat, that of cycles? Would they yield significant correspondence to solar cycles? Ocean cycles? There is close correspondence of temperature patterns in each of these four groups, thus confirming the trustworthiness of all. "Fluctuation" is far more striking than "trend". Any trend measurement must take full account of natural fluctuations in the Arctic. Salehard borders on Yamal, yet its thermometer record is strikingly different from the treering record. And since the pattern at Salehard is backed up by Murmansk, Bjørnøya, Vardø, Kanin Nos, Turuhansk, Ostrov Dikson, Ostrov Vize, and Hatanga, it seems reasonable to conclude that the Yamal treering record is the one that is suspect. The tree ring proxy temperature record stands out by being utterly different. It would not matter that several years are effectively smoothed into each record; what matters is the range, and the comparisons of its downs and ups with the temperature records. It is wildly higher than even the biggest fluctuations. Salehard should show a very similar temperature pattern. Imagine if the Salehard record were smoothed to the level of smoothing of the Yamal proxies, its range of fluctuations would largely disappear. So the Yamal fluctuations are even further out of order. Omsk, Barnaul, Krasnoyarsk and Irkutsk show a similar longterm pattern - level until 1950 or so, then a rise of ~2ºC to 2008. Short-term, the patterns sometimes match and sometimes diverge. The longterm rise could be UHI. Or it could be a natural temperature rise that has occurred, that the continental landmass reflects but the maritime locations, influenced by oscillating ocean currents, do not. It is still not the IPCC graph pattern, which rises from 1900, dips from 1940, and rises again from 1970. Omsk and Irkutsk are completely different to the pattern of all the other stations here from John Daly: Vardø, Murmansk, Kanin Nos, Salehard, Turuhansk, Ostrov Dikson and Hatanga. These stations show very similar cycles that appear to be within range of the cycle that is visible below in the Bodø record, which closely fits the IPCC graph, and also fits a 60-year solar cycle. In the unadjusted Bodø record, the 1930's were warmer: this suggests UHI contaminating an otherwise reasonable IPCC record. I'm not able to do trend lines and smoothed graphs. But these graphs speak volumes. Sun, sea, and continental effects are obvious factors to examine further. Temperatures in maritime locations are strongly moderated by the oceans, rather more so, it seems, in the Arctic winters than in the Arctic summers. We are learning about the effect on land temperatures of ocean currents oscillating between warm and cool, and the lag between equatorial seas warming, at least correlating to the Sun (even if mechanisms are lacking so far), and warming at higher latitudes due to ocean currents moving polewards. 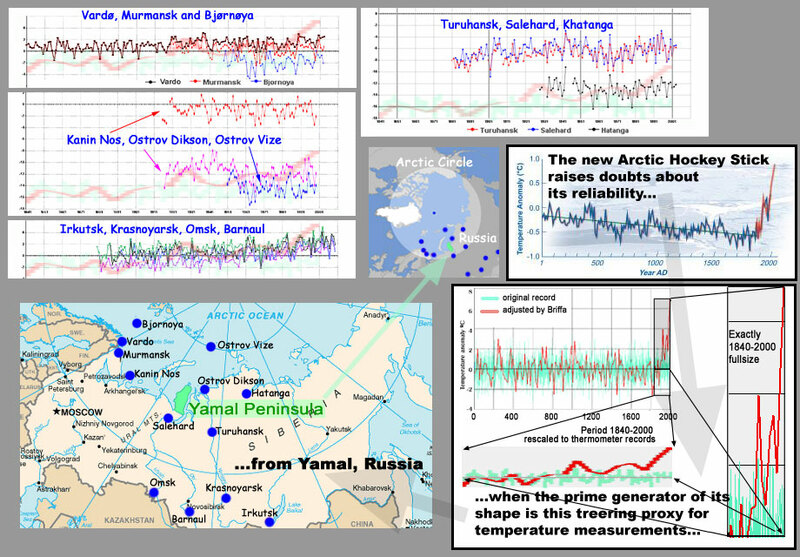 The puzzle is, what actually happened to distort the Yamal treering records - assuming it was not just a fluke or mistake? The Siberian larches are sensitive not only to temperature but also to moisture and CO2 and a whole host of other known factors and microclimate issues. Go here to explore the puzzle further.